Find the Sheet Pan Chicken Fajita recipe here and the Sheet Pan Steak Fajita recipe here. 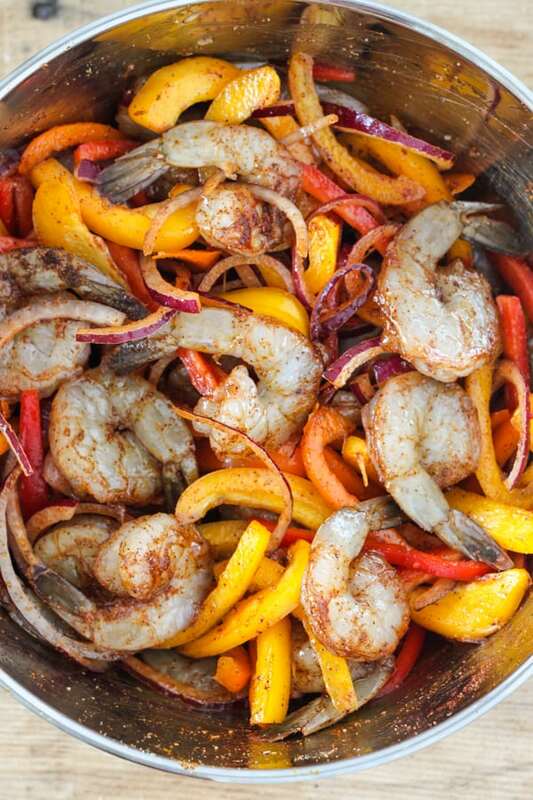 In a large bowl, toss together sliced bell pepper, onions, olive oil and seasonings. If you prefer, skip the bowl and mix everything on the sheet pan and toss to coat. Roast fajita mixture in the oven at 450 degrees for about 8 minutes. 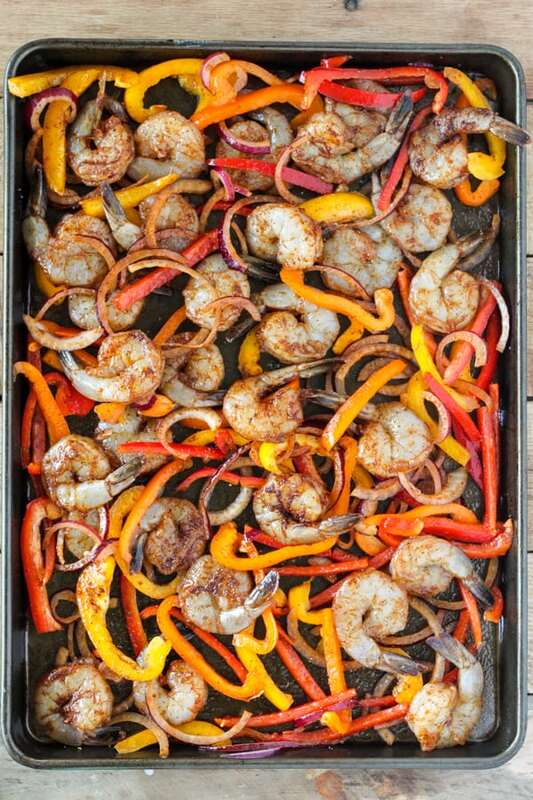 Then switch the broiler on and let the shrimp and bell pepper pick up a little char for about 2 minutes. Yum! 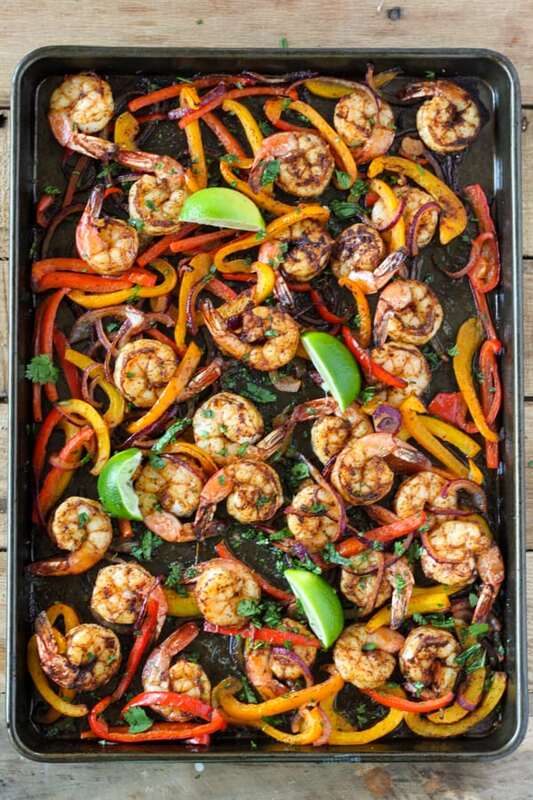 Just try and resist sneaking bites of this delicious shrimp hot out of the oven! 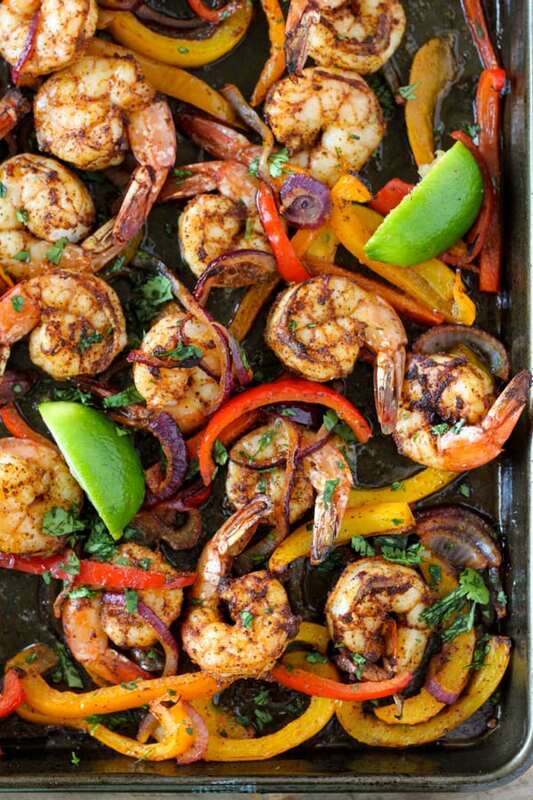 Squeeze fresh lime juice over the hot shrimp and veggies and sprinkle with cilantro. 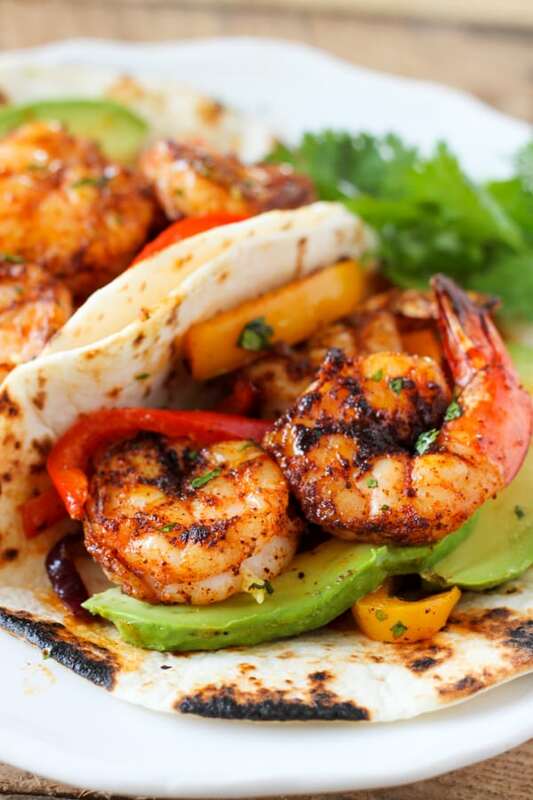 While the shrimp are cooking, warm fajita-sized tortillas on the stove-top. Check out my Shrimp Stir Fry! This was delicious! I prepped everything in the morning, so all I had to do was put it on the sheet pan and put it in the oven. I used the same spices, just a little more of each. Thanks for the recipe! Should we add time if the shrimp are frozen?? I usually thaw them first by running cool water over them in a colander. It’s really quick! I have been on a shrimp kick lately. This recipe looks delicious and quick! This works for me. I like using my broiler. It really gives the food that extra something. Lots of oohs and ahhs when it comes out of the broiler. 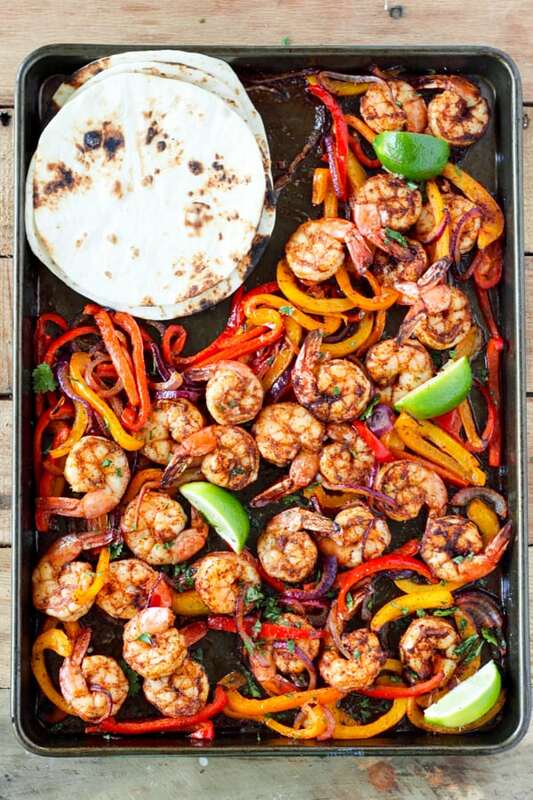 Melissa, the shrimp fajitas look great… definitely going to try them!! 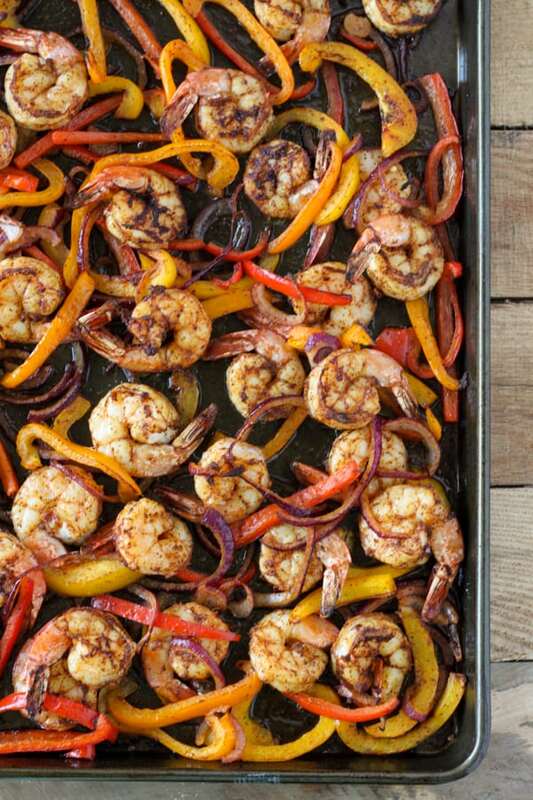 Do you use raw shrimp for the recipe? Thank you! Yes, start with uncooked shrimp! This recipe was so easy and created the most delicious meal. My husband loved it. It’s perfect for a weeknight! Thank you!! Is the shrimp raw or the pre cooked? This looks awesome!! Have you tried with chicken or steak? I wonder if changing up the meat would change the cook time? Made exactly as recipe stated. ( minus measuring exact amount of spices and oil) this is so easy and delicious! Would never have thought about making them this way. Thanks for sharing! This is so easy and SO delicious. My daughter is coming home from college for the weekend and requested this meal. Happy (and excited) to oblige! thanks for this recipe. It was delicious and easy to make. I made it for my son’s birthday! Came out wonderful except for the fact that I peeled and DeVaned The shrimp myself. I must’ve missed a few shells. Next time I’ll spend the extra money and buy it already peeled And deveined. Such a wonderfully delicious meal, will be making this over and over again! So easy to make too. I’m glad you enjoyed the recipe! Thank you! That’s so great! Thank you Elena! I love hearing when families enjoy the recipes! Could you use cooked shrimp for this? I’ve got a big bag of it in the freezer and trying to find something to make haha. 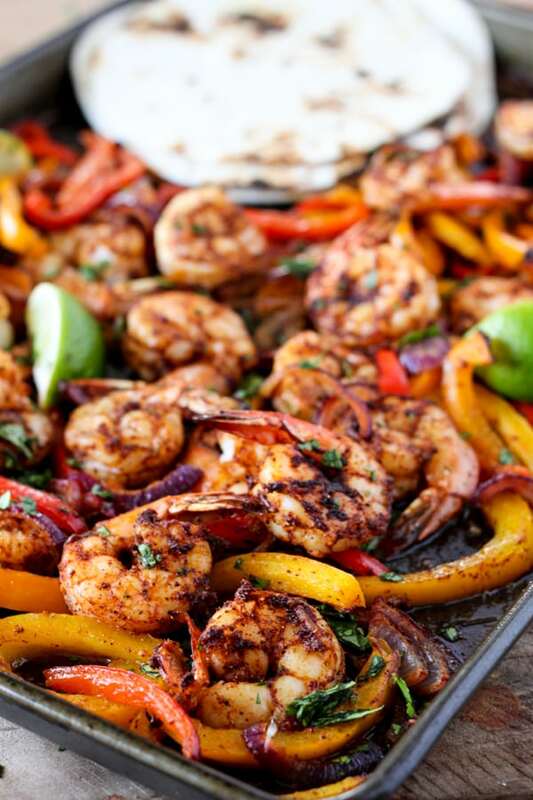 I would cook the veggies and then add the coked shrimp at the very end just to warm them! I’ve made these (as stated) many times – this is a dinner that hits our table frequently. I serve with avocado slices; sour cream; and black beans cooked with a little cumin and garlic. Delish! This was one of the best Pinterest recipes I’ve ever cooked. We will cook it longer next time. Probably 8 minutes and 5 minutes. Seasoning was perfect!! I did marinade the items for about an hour. Delish and simple!! I need more of these! This was absolutely delicious and so easy to make! The only thing I’d leave out was the chili powder. I only used a little but I don’t really like hot. But I ate it and it was great! We travel in an RV and this would be so easy to make on the road. What kind of tortillas did you use ? Made this for dinner tonight. Super easy and as delicious as it looked. Thanks – will make this again! Had this recipe last night and it was hands-down delicious! It’s hard to find recipes that my husband and I can agree on! I’ve had great success with many of your recipes and can always trust that they will turn out. So many times, I see something that looks good on a website, but when I actually make it, it’s meh. Your recipes are 100% solid! Thank you! Looks fantastic and so easy! 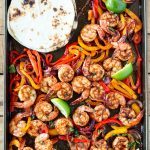 We love shrimp and although we live in Canada we’re from Dallas TX where they have the best Mexican food ever and we miss it dreadfully!! Your recipe will be a keeper! Merci Beaucoup! As they say up here in French Canadian Montreal!! These are delicious! We have them on a weekly basis. Super easy & quick to the table. My fam loves them! This was amazing ! I’m always looking for quick and healthy week night meals since everyone is always running around after work and this was perfect! Even my picky boyfriend enjoyed it and it got a “definitely have to make this again!” I paired mine with some Romain lettuce leaves instead of tortillas to cut down on the carbs and paired the left overs with some cauliflower rice for fajita bowl lunch for tomorrow !! So yummy! Thanks for sharing! My best friend & I love this! Very easy to make & very tasty! I’ve made it several times now & look forward to making it again. Thanks for the recipe.